A while back I was thinking about how all the moms I know are different in many ways – be it their parenting style, or whether they go to work, stay at home, or work from home. Some have one little person, while others have three or four. Some of our babies began their journey inside us learning the sound of our heartbeat, whilst some began in another only to meet us later and hold our hearts forever. Whatever the differences in how we became moms, how we parent… Being a mom, plus ALL that comes with it, is what we all have in common. And that’s how I came up with the idea for this feature – a short interview with regular moms like you and I. Here we’ll get to “meet” different mommies, and find out a little about them. This week we meet Melissa, our second mommy blogger in the series. Melissa is such a lovely lady, and I was so happy to meet her at the recent Jozi meetup. And it’s a pleasure to feature her here today. I’m a journalist by day (well, currently doing PR) and a blogger by night. 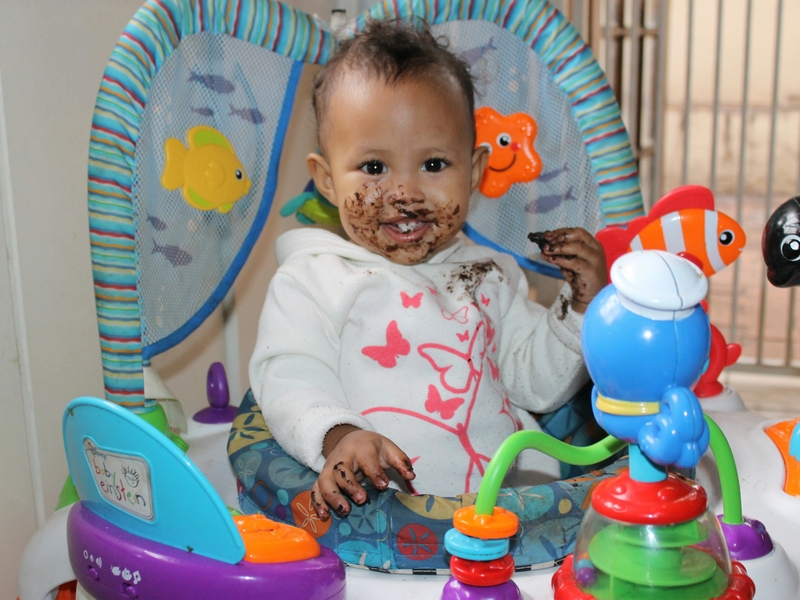 I’m a mother of a 17 month old daughter and my step-daughter is 22, living in Cape Town as a Chef de partie. Married to a music composer, my life is filled with toys, Tupperware, and music instruments laying around on the floor. I’m the first one to hear my husband’s creations. I find myself falling asleep when I put my youngest to bed. Husband will be working through the night on his music. I have to mention that Husband is normally the one who changes Princess’ nappies and who dresses her in the morning. He does it in a fun way – I always hear her laughing. My favourite food to cook is lentils. We enjoy travelling long distances with the car – my parents and other family live in other provinces. 2. What’s the one thing you find most challenging about being a working / stay at home mom? I find it hard to work on my blog or to type anything at home, because my daughter stands on her toes and presses on the keyboard. I also find it hard to discipline my child. To her, “no” means “let’s go there and do the opposite of what mommy says”. She has a happy go lucky spirit, so how can you get angry at her? My child hugging my legs when I am busy doing the washing or the dishes. Just kissing her, and her smile, makes me happy. I realised that my family members won’t tell me I’m doing a good job – so I have to remind myself of the little things I did to be a good parent. I don’t take for granted that my child eats vegetables daily, and you know there’s other small decisions you make that you will feel are best for your child. Remember, you are a good mother, because your child is smiling at you and loves you. You are good enough for your child. My mom used to say, “a mother is the light of the house” so remind yourself you are that light. I seriously can’t think of any funny moments, but my child who is 17 months old started biting her dad and I two months ago. She would bite our thighs while standing in between our legs, or shoulders if you are carrying her. It’s annoying and makes a person nervous. We say “no” but she finds it funny. Good to hear all about you for once! A mother is the light of the house… I like that quote that’s a good one! It’s very nice to meet you. Gorgeous baba you’ve got there ?